John Carey Wolfe was baptized on January 16, 1840, in the Parish of Listowel, County Kerry, Ireland. His parents were Maurice Wolfe, a Catholic farmer, and Ellen Catherine Carey. His baptismal sponsors were John Wolfe and Margaret Sullivan. Wolfe's siblings included James Carey (b. 1831), Ellen (b. 1833), Maurice Carey (b. ca. 1835), Mary (b. 1838), Thomas Carey (b. 1843), Margaret (b. ca. 1845), Johanna (b. 1847), Richard Carey (b. 1848), Catherine “Kate” (b. 1851), and Bridget Veronica (b. 1854). In 1847, Wolfe, his parents, and several siblings immigrated to the United States, along with Maurice Wolfe’s first cousin John R. Wolfe and his family. (Maurice Wolfe and John R. Wolfe shared a grandfather, James M. “The Barrister” Wolfe.) The families arrived in New York on August 23, and after a stop in Chicago made their way to LaSalle County, Illinois. Many members of the extended Wolfe family made the same journey. John C. Wolfe’s uncle John Wolfe emigrated in 1849. John R. Wolfe’s brother Thomas R. came from Ireland in 1848 and his brothers Maurice R. and Richard separately in 1849. Other cousins came, as well, including Margaret and Elizabeth Maher, daughters of John R. Wolfe’s sister Ellen, and Patrick, Dennis, Bridget, and Thomas Sheehan, the children of John R. Wolfe’s sister Margaret. Another cousin, John E. Wolfe, and his sisters Ellen J. and Mary Agatha, also emigrated. All of these Wolfes, except for the Sheehans, settled in LaSalle County, Illinois. A few moved on to Clinton County, Iowa, including John C. Wolfe’s father Maurice and Maurice’s cousin John R.
On the Illinois prairies [Wolfe] was reared to habits of thrift and usefulness, and at twenty-one years of age he and six other young men, who had been his boyhood friends, had the opportunity to cross the plains in a band of emigrants, all of whom were home seekers and ambitious of better things. From time to time he added to his stock, distinct advantage being found in the fact that he manufactured many of his own medicines, which came to be known for their efficacy in the common disorders. Throughout the length and breadth of the county, and even beyond, Wolfe's liniment, pile cure, worm powder, catarah snuff, and corn cure were household treasures and found their way into thousands of individual medicine chests. In 1872, he moved his business to Fourth Street, between B and C streets, in San Rafael, Marin County, just north of San Francisco. On November 27, 1884, Wolfe married Ellen Louise Martin, a native of Chicago, and the couple had one son, Maurice Joseph (b. 1886). Ellen Martin's father, Peter Martin, was a prominent architect in Chicago, while her uncle, Edward Martin, was a founder of the First National Gold Bank, in San Francisco. This allowed John and Ellen Wolfe access to elite San Francisco social life. Wolfe bought land at the south end of D Street, in San Rafael, and built a large two-story house there. "I have the prettiest house in California," he told a reporter for the San Francisco Daily Examiner on August 14, 1887. Wolfe admitted to the paper that, "yes, business in my line is pretty dull, I must say. But then that, I should think, is the best thing that can be said in favor of [San Rafael]." Wolfe died at his home on July 25, 1902, after what his obituary described as "a lingering illness of several weeks." (A portion of D Street was later renamed Wolfe Avenue.) 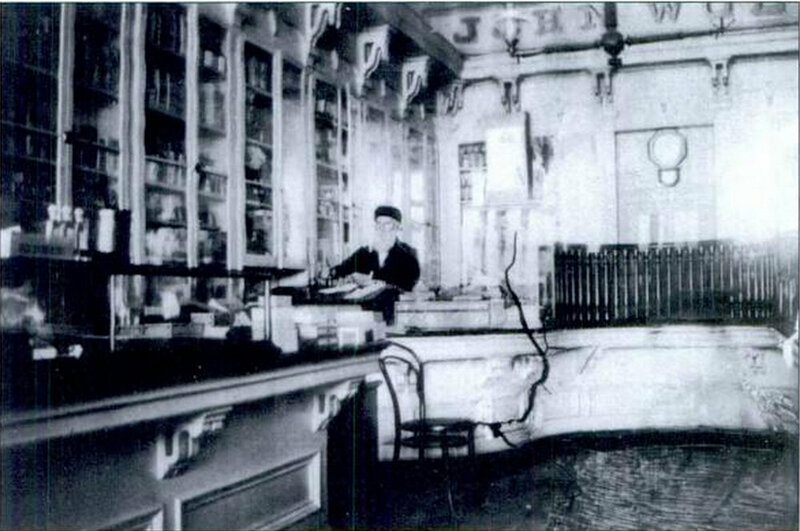 His wife, Ellen, with the help of Wolfe's clerk, Thomas Day, ran the drug store with the hope that the Wolfes' son, Maurice, would take it over. (Maurice Wolfe died in 1918.) The federal census of 1930 identifies Ellen Martin Wolfe as living in Saint Catherine's Home, at 901 Potrero Avenue. Staffed by the Sisters of Mercy, an order of nuns established in Ireland, the home served both as a shelter and a school and training center for women in need. Wolfe died on December 8, 1930, probably at the home. She, her husband, and their son are buried together at Mount Olivet Cemetery in San Rafael, California.